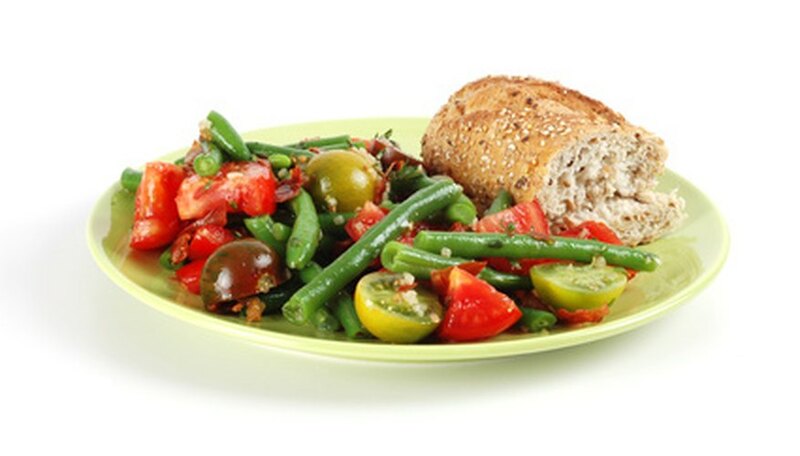 Green beans are a popular vegetable plant for the garden. Bush beans, such as the Bush Kentucky Wonder variety, grows without support as a small bush and produces beans prolifically over two or three weeks. Another type is known as Pole beans, such as the Blue Lake variety, and grows on a trellis or pole. Pole beans produce beans over a period of six weeks or longer. Green beans should be harvested when the pods are firm and before the beans inside the pod are fully formed. That is when they are the most tender and are not yet fibrous. This is referred to as the "snap" stage when the beans can be easily "snapped" in half. Prepare a planting area in average garden soil when the soil temperature is at least 70 degrees F. Beans grow best if they are not grown in the same soil beans were grown in over the last three years. That is because disease pathogens that attack beans can live in the soil for several years, so crop rotation is important. Beans grow best in full sun, which is an area the receives at least six hours of full sun each day. Use a shovel to dig out all weeds and loosen the soil to a depth of six inches. Cover the soil with a 1-inch layer of compost and recommended amount of granulated organic fertilizer, and work the compost and fertilizer into the top 2 inches of soil. Treat the beans with the Rhizobia bacteria, which is readily available from most vegetable seed companies found on the Internet and in most seed catalogs. Simply put the bean seeds in a paper bag with the powdered bacteria and shake until the seeds are covered. The bacteria will grow in the soil around the beans' roots and and helps the beans capture nitrogen from the atmosphere and store it in their roots. Rhizobia bacteria dramatically increases yields and eliminates the need for fertilizer after the first application of fertilizer, which is applied to get the plants off to a fast start. Plant the bean seeds 1 inch deep and 1-2 inches apart. To avoid rubbing the bacteria off the seeds while planting, dig a 1 inch deep trench, set the beans in it 1 inch apart, then cover with compost enriched soil. Rows should be planted 2 to 2 1/2 feet apart or more. Thin the plants to 4 inches apart when they get their first set of true leaves. Water bean plants lightly and evenly from planting to flowering. Green bean plants do not like to dry out. When beans begin to form on the plants, increase watering level slightly, but don't allow plants to sit in water, because this causes the roots to rot. Do not overhead water because this increases the chance a disease called bean rust or other fungal diseases may form on the plants. What Do Bean Plants Need to Grow? How Does Sand, Clay or Potting Soil Affect the Way a Bean Grows?